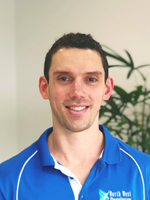 Tim is our principal Physiotherapist and has over 8 years of clinical experience dealing with everything from acute sporting injuries to chronic back and neck pain. He has worked with various high level sporting teams including the Aspley Hornets and the Mitchelton Football club. He is also a qualified Western acupuncture/dry needling practitioner and a trained Bounce Back instructor. Bounce Back is a revolutionary class or one-on-one training program to improve spinal strength and stability.